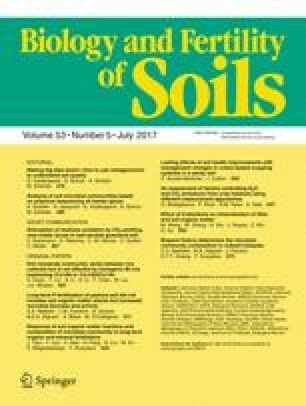 The soil organic matter (OM) content of soils in a long-term fertiliser field trial (Winchmore, New Zealand) are similar (P > 0.05) despite >60 years application of different phosphorus (P) rates. As the net primary productivity increased with P addition, greater losses of carbon (C) occur concomitantly with increased P fertility. Several hypotheses have been proposed to explain the mechanisms, including C leaching, increased earthworm activity or elevated rates of microbial activity. In this study, we found support for both direct and secondary effects of soil P on soil C through impacts on the soil microbial community. Microbial biomass, inferred through quantification of hot water extractable C, increased with soil P status and decreased with C/P ratio (P < 0.001). However, the microbial biomass had no relationship with soil organic C content (P = 0.485). Mineralisation of C substrates added to soil also increased with soil P status (total P, R 2 = 0.84; P < 0.001). These results indicated potential conditioning of the microbial community for rapid C cycling. Utilisation of different C compounds was clustered by cophenetic similarity; a distinct group of ten carbon compounds was identified for which rates of mineralisation were strongly associated with soil P status and microbial biomass. However, this alteration of microbial community size and activity was not reflected in abundances of selected oligotrophic and copiotrophic taxa. As such, the alteration may be due to changes in the abundances of all taxa, i.e. a general community response. The online version of this article (doi: 10.1007/s00374-017-1212-2) contains supplementary material, which is available to authorized users.